More of a case of what I'm going to do with them for the moment. Because these ventilators are tall and narrow I'm going to drill and peg them as I did with the parts in week 56, using 1mm brass wire. Unfortunately my 1mm drill broke and I haven't got a replacement yet - so this week is being held over for the moment. All I have done so far is file off the mould marks with a file needle file. Here you can see I've put the brass pegs in each of the ventilators and have stuck them into Blutac ready for painting. The ventilators were sprayed white, then the intakes were picked out in black. 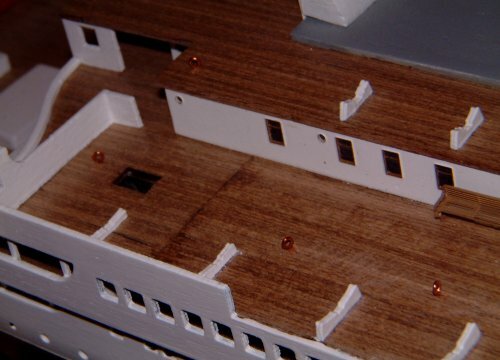 The locations were carefully marked on the deck, then 1mm holes were drilled. Finally it was a simple case of a drop of Super glue on the bottom of each vent and put it in the hole. Just make sure it's pointing forward and is upright. You'll notice that 2 vents are missing. These are the ones close to the handrail. 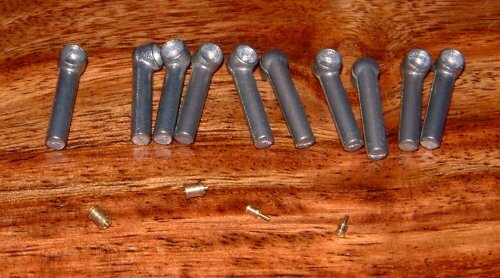 I've drilled the holes for these, but I've decided not to fit them until after the handrail is in place. Next comes all those little copper eyes in the deck. I used paper templates to mark the position of the eyes to make sure they were in a straight line. The paper template was placed on the deck, then I pierced the deck with a needle held in a pin vice or suitable modelling knife handle. You only need to make the template for one side as you can simply turn it over to do the other side. Just push the needle through the holes in the paper and you can be sure of getting both sides perfectly symmetrical (as long as the paper is in the right position.) 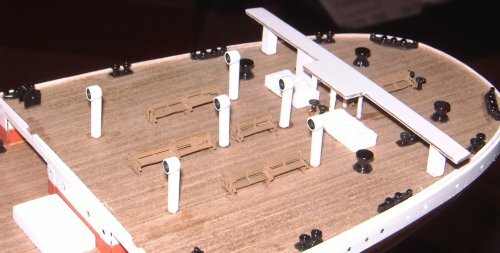 With the holes all marked, drill them with a 0.6mm drill. You will see that most of them go through the deck and into the space above the deck below (if you see what I mean). 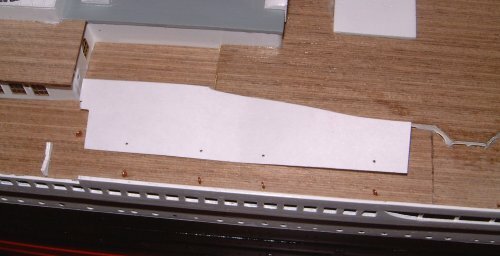 This means that you will only have the thickness of the deck to glue the shafts, so the holes need to be a snug fit. The eyes are glued in place with super glue. Cut the shaft quite short (about 1 or 2mm) so that you don't see it protruding in front of the cabin windows in the deck below. Note that I've also angled the eyes towards to centre of the funnel. I just did this by eye, and I'm not sure if it is historically correct. There are still the Morse and navigation lanterns to fit. These look quite vulnerable to damage so I'm going to leave them till later. I don't believe that it is correct to paint the inside of the lantern boxes red and green. It's more usual to see these painted black, with red or green lenses on the lights. This is what I intend to do. 61 - 2 benches to fit after to railing have been fitted and two skylights to be fitted. 74 - Ship's names to paint white. Always keep a spare 1mm drill !!! !